The event brought goats and their handlers from Laughing Goat Yoga Studio in nearby Thorndale to the St. Marys, Ont. long-term care home. “Goat yoga,” as it is called, uses traditional yoga exercises, but with a twist – people get to handle small goats and watch them walk about while doing their exercises. This, says Laughing Goat Yoga Studio, has a calming effect on people. Additionally, goats have a strong balance with nature, notes Wildwood life enrichment assistant Elizabeth Hardy, who organized the event. Goats, she adds, are sturdy and confident in their motions, and watching these animals while practising yoga augments the benefits of the exercises. Elizabeth became connected with the studio after attending a goat yoga session. She asked the folks at the studio if they could come to Wildwood Care Centre to do a session with residents. The studio had never hosted a session with long-term care residents but its team wanted to give it a try. 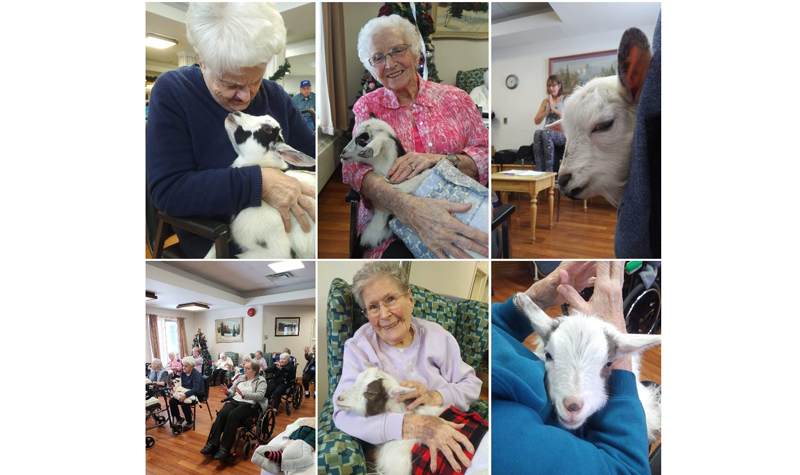 Participating residents did chair yoga for 30 minutes, coupled with “lots of goat cuddling,” Elizabeth says. “I like to look for ideas that are a little different because any experience we can give the residents that is a little bit out of their norm is always wonderful,” Elizabeth tells The OMNIway. Residents garnered lots of “pet-therapy benefits” from handling the four goats that were at the home that day, Elizabeth says. “Being a farming community here, seeing the goats was the best thing for them – they see dogs all the time, so this was a nice change,” she adds. Elizabeth says the activity was “a good first test” for both Wildwood Care Centre and the Laughing Goat Yoga Studio. “I would highly recommend this program to anyone,” she says. Click here to learn more about Laughing Goat Yoga Studio.